Jonathan Drew, right, inviting Preston Van Winkle of Old Rip Van Winkle Distillery to the stage. 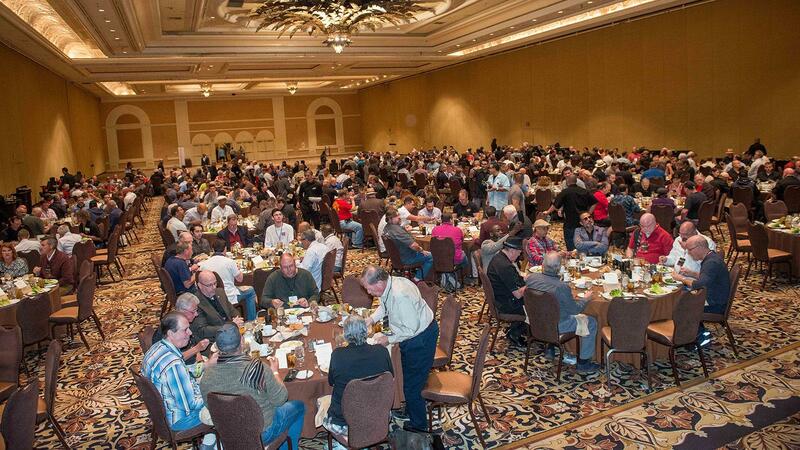 After smoking three of Cigar Aficionado’s finest cigars of 2017 and listening to seminar presentations all morning, the hundreds attending the Big Smoke Saturday seminars needed time to refuel, and headed to the Grand Ballroom at the Mirage Hotel and Casino for a feast of food and wine. Lunch was hosted by Drew Estate, and there were pleasant surprises ahead: upon entering the Grand Ballroom, guests were handed a pack of rare and unreleased Drew Estate cigars, a bounty for collectors and fans who enjoy lighting up hard-to-find smokes. Each pack included a Liga Privada Único Serie Velvet Rat, a Herrera Esteli Lancero Edicion Limitada, a Liga Privada Único Serie Dirty Rat and two commercially unreleased sizes of Pappy Van Winkle Tradition: Lonsdale and Corona Extra. A Boveda pack inside the bag kept the cigars fresh in the dry Las Vegas air. As the crowd moved to their seats, Cigar Aficionado executive editor David Savona took to the podium at the front of the ballroom to introduce Drew Estate company founder Jonathan Drew, who kicked off the lunch with a cocktail and a toast to a certain cigar magazine’s 25 years in the business. Guests were given a Brixton Mash Destroyer Old Fashioned, garnished with a slice of blood orange, and the room stood and raised their glasses. The rare cigars included, from left, a Herrera Esteli Lancero Edicion Limitada, a Pappy Van Winkle Tradition Lonsdale, Liga Privada Único Serie Velvet Rat, Liga Privada Único Serie Dirty Rat and a Pappy Van Winkle Tradition Corona Extra. Lunch began with a Caesar salad, followed by the main course of seared beef tenderloin and grilled basil shrimp. Drew remained on stage to speak about his company, its innovations and its road to success. 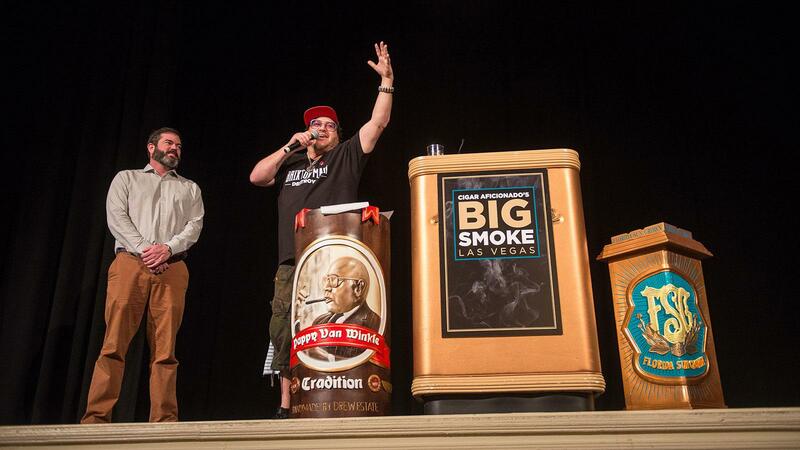 Drew then invited cigarmakers and friends to the stage to thank them for helping the company become what it is today. Among the notable individuals, Preston Van Winkle, of Old Rip Van Winkle Distillery, Willy Herrera, master blender at Drew Estate, and Jeff and Tanya Borysiewicz, of Corona Cigar Co. Guests dining inside the Grand Ballroom. As Drew continued his speech, waiters poured 19 Crimes The Warden wine. Dessert followed, which was a mascarpone cheesecake with marinated fruit, bittersweet chocolate cream and blackberry caramel. “Thank you all for coming…thank you to everyone on the team, and thank you Cigar Aficionado,” Drew said in his closing remarks. The audience roared with applause and finished their meals. With full bellies (and full pockets) they headed out into the hotel and casino for a few more hours of fun and excitement before gearing up for another Big Smoke evening celebration.